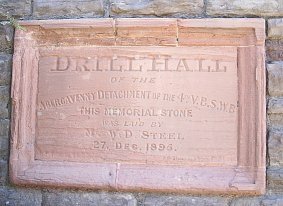 The drill hall has been a part of British military and social life since the 1860s, when Corps of Rifle Volunteers constructed premises for drill, funded by benefactors or public subscription. The heyday of the drill hall began in the 1880s, following the Cardwell reforms of the Army, in which the Rifle Volunteers were formed into Volunteer Battalions of the County regiments to which they were affiliated. Many of the Senior Officers of the units were also local businessmen or landowners, and funded not only the building of premises but the raising and equipping of the units themselves. Other units raised funds for building by means of the formation of limited companies, or public subscription and fundraising events such as fêtes and bazaars. Further changes in the development of the drill hall occurred following the disbandment of the Volunteers and the formation under the Haldane reforms in 1908, of the Territorial Force and the County Territorial Associations who provided the administrative support for the units in their area. In Staffordshire for example, a number of premises were built which provided shared accommodation for infantry, artillery, engineer or medical units, and facilities for the local Yeomanry units. There is no such thing as a standard design of drill hall. Although most premises followed the same basic principles of a large shed or hall, around 80 feet by 40 feet, with offices and stores attached, the frontages of the premises were generally quite individual. From the crenellated stone toy-fort style found at Ardwick in Manchester or Bury in Lancashire, to the more usual brick and tile buildings found in sleepy market towns, the design was often at the whim of the architects. Many premises had a dwelling-house attached for the caretaker, usually a time-expired sergeant. Decoration of the frontages often included a regimental device in stone or terracotta. Not all units had drill halls, often sharing existing public premises like town halls or, in a couple of instances, places of employment for work raised units such as the South Midland Brigade of the Royal Field Artillery who were raised and based at the Metropolitan Works in Saltley, Birmingham. 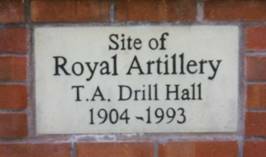 Although primarily a building for military training, the drill hall provided a useful space for other organisations and functions, including fetes and dances, which provided funds for the upkeep of the hall. Many older people have fond memories of social events held there. In later years, many drill halls passed into the ownership of local authorities, to be used as leisure facilities, GPO sorting offices or telephone exchanges, often replaced in later years by more modern premises for the new occupiers. Many others were downgraded to cadet unit premises, with new purpose built structures for the parent unit built alongside. Some passed into the private sector to be used as engineering or stores buildings. The current trend for the redevelopment of brownfield sites has caused the number of demolitions to increase dramatically in the last few years. The space provided by a drill hall yields a valuable space, often close to the town centre, and these redundant buildings are often replaced by apartments or houses. Often all that remains is a plaque or stone to mark the site.